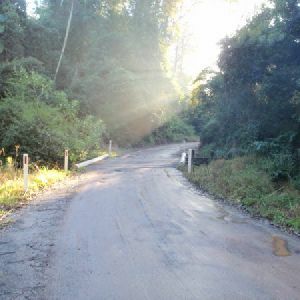 An excellent walk, spending much of its time in the shaded, rainforest-filled valleys of the Strickland State Forest. 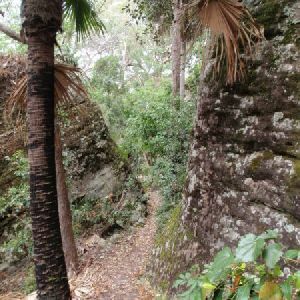 From the dry eucalypt forest around the Banksia picnic area, the walk soon descends into moist forest, filled with ferns and cabbage tree palms. 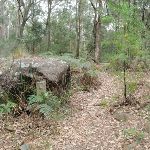 You could make this a return walk by retracing your steps, or make it a circuit walk by returning to the Banksia picnic area via the road. 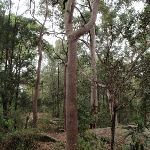 The Strickland State Forest, managed by State Forests of NSW, is located on the NSW Central Coast, close to the F3. 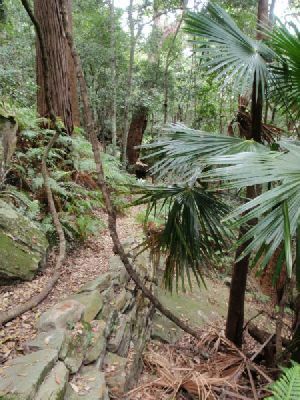 The Strickland State Forest has a wide range of vegetation, including patches of rainforest along the sheltered creeks. 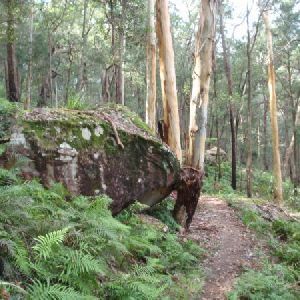 The walking tracks take in some beautiful scenery, including a mixture of native forest and the remnants of an old arboretum. 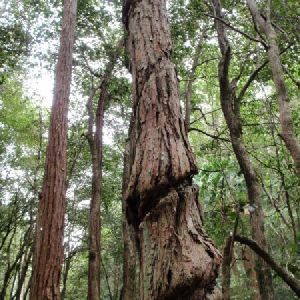 ‘Strickland is no longer actively harvested and is managed for education and recreation purposes’. The ‘Friends of Strickland’ undertake projects including the construction of walking tracks. Note: Access into Strickland is during the daytime only with the entrance gate being unlocked between 7am and 5pm (Apr – Oct) and between 7am and 7pm (Nov – Mar)  More info. 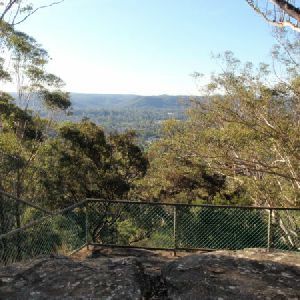 From the car park (near the end of Strickland Rd in the Strickland State Forest), this walk passes around the gate and goes across the picnic area to the track intersection at the opposite end. There is a track signpost (‘Strickland Falls Loop Trail’) a little to the left. 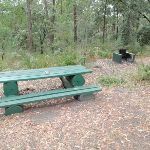 This picnic area is in the Strickland State Forest, on the NSW Central Coast. The facilities include picnic tables, pit toilets, BBQ fire places, garbage bins and tank water. 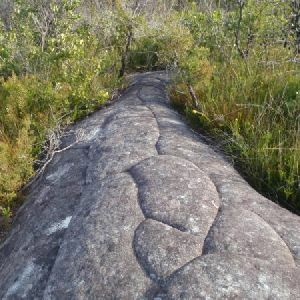 A few bush walking tracks start from the picnic area. 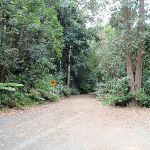 Veer left: From the intersection, the walk follows the ‘Cabbage Tree Walk Trail’ arrow along the bush track, leaving the ‘Gosford Lookout’ sign behind, to the right. 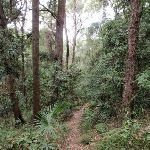 The walk initially passes through relatively dry forest, with signs naming some of the trees, before descending through moist forest, filled with cabbage palms. After a while the track reaches the intersection signposted ‘Stoney Creek Trail’. 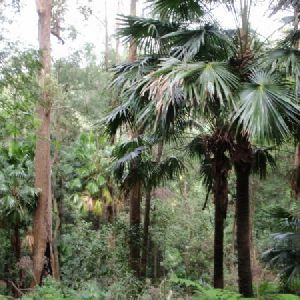 The Cabbage-Tree Palm (Livistona australis) is a tall, slender palm growing up to about 25 m in height and 0.35 m diameter. 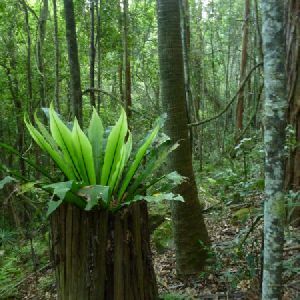 It is found in moist open forest, often in swampy sites and on margins of rainforests or near the sea. 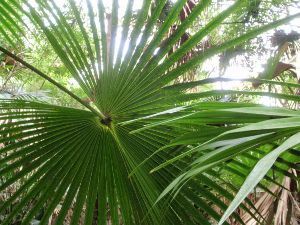 It is widely spread along the New South Wales coast and extends north into Queensland and southwards to eastern Victoria, growing further south than any other native Australian palm. More info. 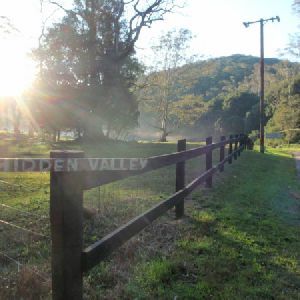 Veer left: From the intersection, the walk follows the ‘Stoney Creek Trail’ arrow along the bush track, going down the hill. 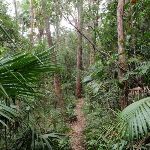 The track descends gently through forest filled with ferns and cabbage palms, before passing a ‘Rainforests and Preservation’ information sign, and arriving at an intersection with a management trail, beside Stoney  Creek. Veer left: From the intersection, the walk follows the management trail up the hill, away from the creek crossing. The walk passes an information board, with a map of the walking trails, and soon reaches the car park. Around 2.1km of this walk has gentle hills with occasional steps, whilst the remaining 50m is flat with no steps. 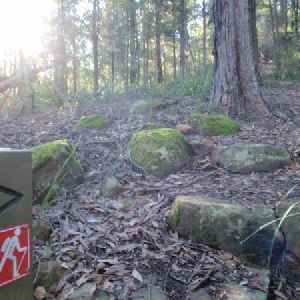 Around 1.1km of this walk follows a formed track, with some branches and other obstacles, whilst the remaining 1.1km follows a clear and well formed track or trail. Around 2.1km of this walk has directional signs at most intersection, whilst the remaining 80m is clearly signposted. 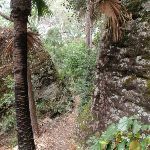 This whole walk, 2.2km requires no previous bushwalking experience. 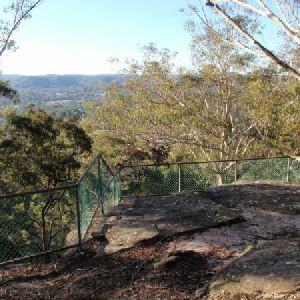 Around 2.1km of this walk has limited facilities (such as not all cliffs fenced), whilst the remaining 50m is close to useful facilities (such as fenced cliffs and seats). A list of walks that share part of the track with the Stoney Creek Trail walk. 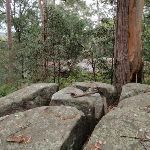 A loop walk with plenty of excellent scenery. 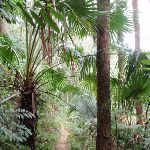 The walk starts in the dry eucalypt forest around the Banksia Picnic Area and soon descends into lush green rainforest remnants, filled with ferns and cabbage tree palms. 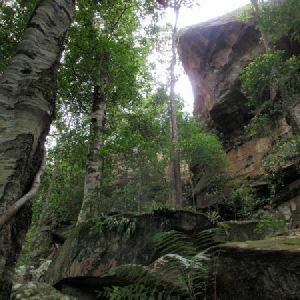 The walk includes some great scenery along the base of the cliff line and around the falls, although the falls themselves are often just a trickle. 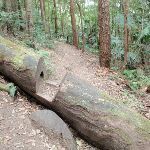 A great walk to experience a slice of the beautiful scenery of the Strickland State Forest. 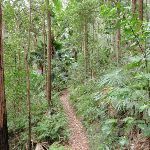 A very nice walk through a mixture of native (regrowth) forest and one of Australia’s oldest arboretums. The arboretum has both native and exotic trees, with the plantings dating from 1887-1924. 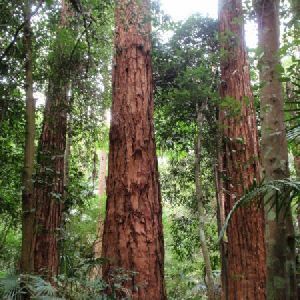 This walk takes you along some of the rainforest-clad creeks of Strickland State Forest, before crossing a small suspension bridge and looping through the arboretum with its stands of huge Hoop Pines, Bunya Pines and others. 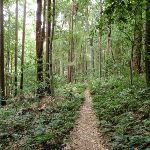 A great walk, passing through plenty of the Strickland rainforest, and among the tall tress of the arboretum. 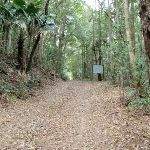 You are likely to have the sound of Bellbirds adding to the atmosphere along parts of this walk. 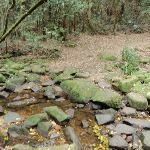 There are a number of picturesque creek crossings along the way, one with a small suspension bridge. 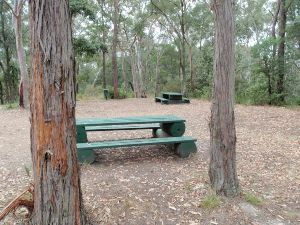 The Banksia picnic area is a very short deviation off the road if you want to make use of the facilities. 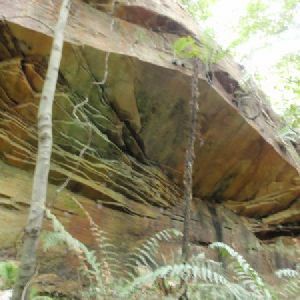 A grand tour of the Strickland State Forest. 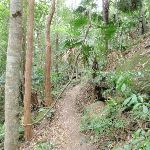 This great walk covers most of the established walking tracks in Strickland and enjoys much of the excellent scenery available in the area. Plenty of time is spent in the lush green, rainforest-filled valleys, and there is some really nice boulder and cliff scenery along the way. A loop through the old arboretum adds further interest to the walk. A list of walks that start near the Stoney Creek Trail walk. 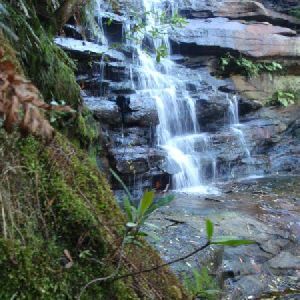 This short walk starts from the Somersby Falls picnic area and follows the series of waterfalls along Floods Creek. The picnic area provides barbeques, picnic tables, toilets and ample parking. This walk could make part of a great family day out in the area. 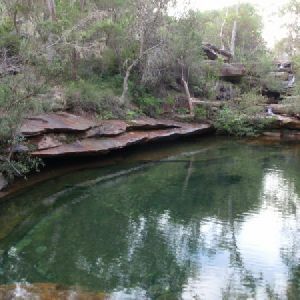 The main falls drop onto a large rock platform and are best viewed after rain. 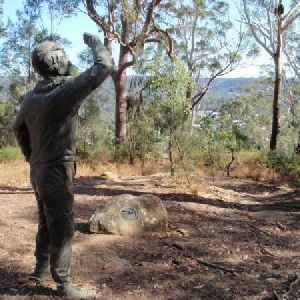 http://new.wildwalks.com/wildwalks_custom/includes/walk_fire_danger.php?walkid=nsw-stricklandsf-sct Each park may have its own fire ban, this rating is only valid for today and is based on information from the RFS Please check the RFS Website for more information.